Pretty much my favorite healthy weeknight meals are all stir-fries; I love that I can prep all the ingredients earlier when the day when baby Willbo is napping and when I’m not exhausted and overwhelmed in the after-school rush. I love that they’re loaded with fresh veggies and lean proteins, and yet they taste so good that you don’t feel deprived and sad. I love that I can feel that nerdy thrill of satisfaction when I use up all that produce in my fridge that I bought with really good intentions 5 days earlier. This stir-fry has been a major hit at our house the last few months. Even people who don’t like stir-fries (my babysitter and go-to gal Laura), even people who don’t like steak (my daughter), even people who don’t like green beans (my son), even people who don’t like doing dishes (me). Everyone loves it. My daughter cried when she ran out of meat. She asked if she could have it for lunch the next day. I wondered what demon spawn of pleasantries had possessed her. 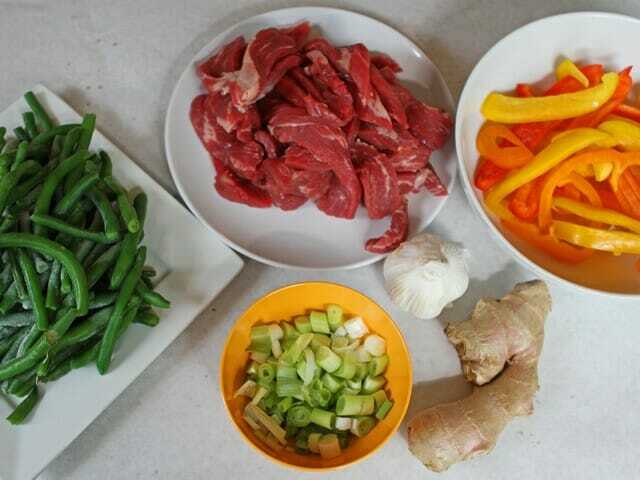 To get started, you’ll need 1 1/2 pounds of flank steak, a sliced colored bell pepper (I had a whole bunch sliced up, so I just grabbed a few handfuls), a pound of green beans (fresh or frozen; I use frozen because I’m lazy), fresh ginger, fresh garlic, and a bunch of green onions (chop up the whole bunch and use the firm, white ends in the stir fry and the green stems as a garnish). Then for the sauce, you’ll need pear juice, soy sauce, brown sugar, sriracha, and sesame oil. and 2 tablespoons of pear juice as well. 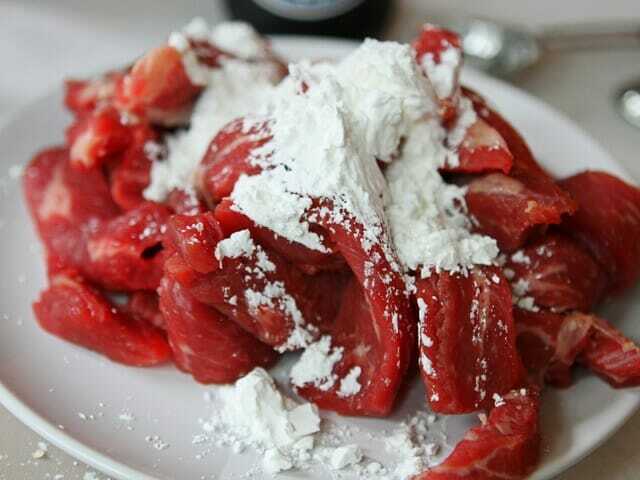 and toss to coat the steak. Add the green beans and cook for 2-3 minutes or until they start to become tender-crisp. 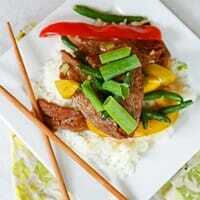 Add the chopped white ends of the green onions and the bell pepper and cook 1-2 minutes more. Add the garlic and ginger and cook until fragrant. Add the steak back to the pan and cook until the steak is heated through. Turn the heat to high and add the sauce ingredients and bring to a boil. While the sauce is heating, whisk together the reserved cornstarch and pear juice. When the sauce is boiling, add the cornstarch mixture and cook about 1 minute or or until the sauce is clear and thickened. Remove from heat and serve immediately over hot rice. Whisk together the sauce ingredients and set aside. Set aside 2 tablespoons of cornstarch and 2 tablespoons of pear juice as well. Slice the steak into 1/4″ slices (or slightly thinner if you prefer). 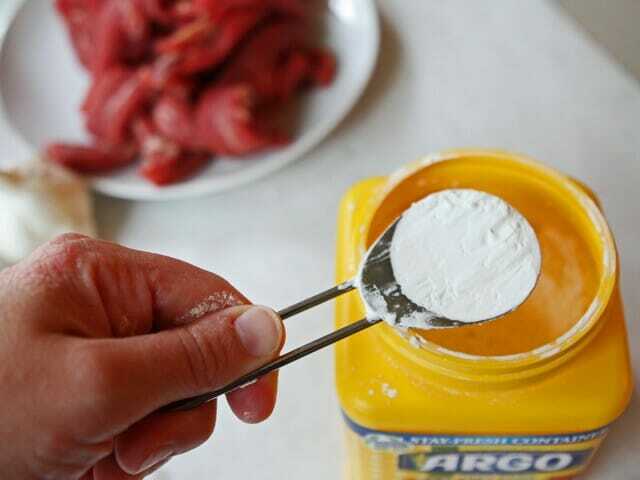 Sprinkle them lightly with 1 tablespoon of cornstarch and toss to coat the steak. Turn the heat to high and add the sauce ingredients and bring to a boil. While the sauce is heating, whisk together the reserved cornstarch and pear juice. When the sauce is boiling, add the cornstarch mixture and cook about 1 minute or until the sauce is clear and thickened. Remove from heat and serve immediately over hot rice. Makes 6 servings. Love all the colors in this!! 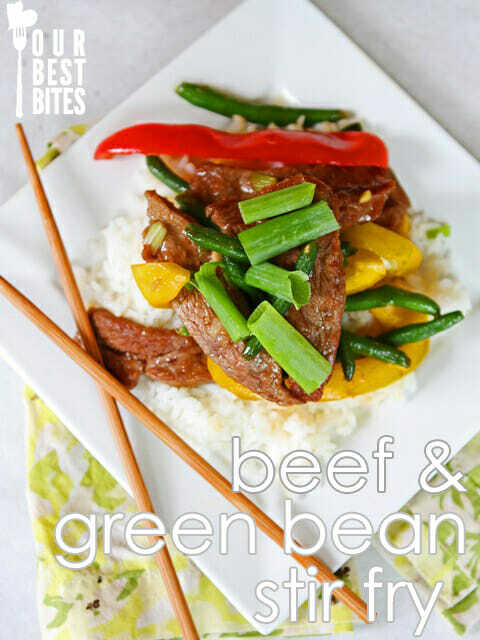 Such a perfect quick and healthy weeknight meal! Sounds really good and it’s pretty too! Could you sub apple juice for pear juice? I can’t wait to make this and have all of the ingredients except pear juice. Yep, definitely. White grape would also work. This looks beautiful and colorful! I’d love to see what dimension the pear juice adds because I love home canned pears. I had never seen the “coat in corn starch before cooking it in some EVOO” technique until your chicken stir fry. It is genius, and sometimes I just make the chicken and we eat it as chicken nuggets. Can’t wait to try it with the beef! This looks so good I want to eat it right now! You ladies are the best, thank you for all of your hard work and wonderful recipes. now this looks awesome! dang too bad i just did my weekly grocery run…next weekend then! 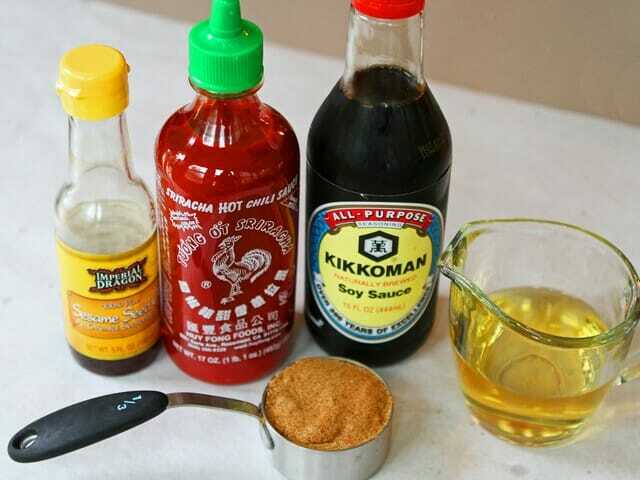 Is there an alternative to the sriracha? Anything that says “Hot Chili Sauce” will not go over well in my house. I don’t care how “not hot” people say it is, it’s still too hot for our taste. 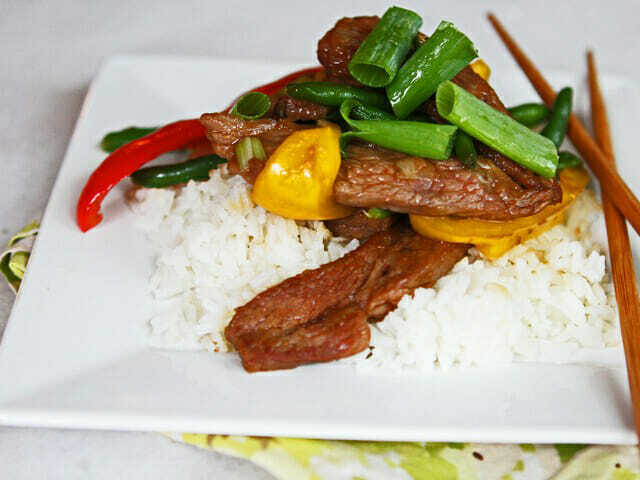 Nothing against the spicy stuff, but the one and only meal from you lovely ladies that my family *hated* (bothers me even to say that because it NEVER happens) was the Chinese Orange Beef because of the chili sauce in it. So, I need an alternative. Any thoughts?! Yep, just leave it out. You might want to add 1/2 teaspoon of vinegar in its place, though, to make up for that flavor (rice wine vinegar if you have it; if not, white vinegar would work). Sounds delish…….pear juice? Is that bottled like apple juice? Quick question, Where do you find pear juice? I did not see it at Wal-Mart unless I’m looking in the wrong section. Thanks! Try the juice section by the canned fruits, as well as the cooler by the milk and juices. If you can’t find it, feel free to sub apple! I made this for my family last night and they loved it! We don’t like anything “hot” but we used the sriracha sauce anyways and still loved it. It didn’t have a hot or spicy taste at all. We made this last night and it was really good. We will make it again for sure. We didn’t have steak so we used chicken thighs and could not find pear juice so we used apple juice. YUM!! This was SO delicious! Thank you for another great recipe! Loved this! Great flavors. I used fresh green beans. I’ve made this before and loved it–going to do it again tonight! I can never find pear juice except in the baby food aisle. Works great because it’s a small bottle and the recipe doesn’t use a lot.